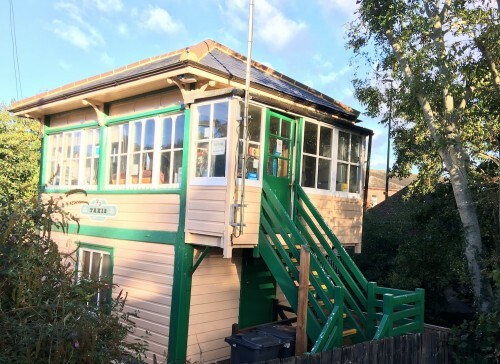 Plans to replace wooden steps to the historic Uckfield signal box with metal ones have met opposition. The ‘Saxby and Farmer’ box, now used as a taxi office, is believed to date from about 1900. Uckfield Town Council, which owns the building, has applied to Wealden District Council to replace the current steps, which are in a poor state of repair, with a galvanised steel staircase and handrail. The decision to make the change was agreed in the spring. See our story here, with photographs of the temporary supports to the steps. The council’s own plans committee only narrowly voted to support the application after former deputy town mayor, Cllr Duncan Bennett, attacked the proposal as “sacrilege”. Former mayor, Cllr Louise Eastwood, said the metal structure would not be out of keeping. A local resident, Gary Cooper, of Mill Drove, Uckfield has also registered his opposition saying the proposal is “completely out of character with the signal box, which is an integral part of the town’s history”. A decision on the application will be made by Wealden District Council. The signal box was used to control the level crossing when the railway station was on the other side of the road (where the large Network Rail car park has been constructed). Uckfield was the terminus of the line after the route to Lewes was closed in 1969. The town still suffered traffic disruption when trains went across the High Street to the station. In 1991, a new station was constructed on its present site but the modern, station building was not opened, however, until 2010. The platforms were lengthened in 2016 to allow longer trains to operate, easing overcrowding on peak services. The signal box is painted in the historic colours of the Southern Railway – green, cream and white. It was made by the renowned Saxby and Farmer company which was one of the biggest railway signal manufacturers and constructed boxes for many railway companies. There is a similar structure at Isfield, although the bottom part is brick-built. It is part of the Lavender Line, which was named after A.E. Lavender and Sons, coal merchants, which operated from the station yard. *John Saxby is regarded as the father of modern railway signalling. *At one time, the steps to the Uckfield box were straight.